Recent rulings in U.S federal court could have a significant impact on the population and lifespan of salmon in Northwest rivers. The health and numbers of salmon in the region—which includes Canada, Washington state, Oregon, California, and Idaho—have long presented challenges. In late June, a federal appeals court ruled that treaties guarantee the rights of Native American tribes to fish for salmon. The court also ruled that the tribes have a right for there to be salmon to catch. The interests of Native American tribes, who were promised the right to access salmon in treaties signed 150 years ago, have sometimes clashed with interests in the industrial, energy, development, and agricultural sectors. 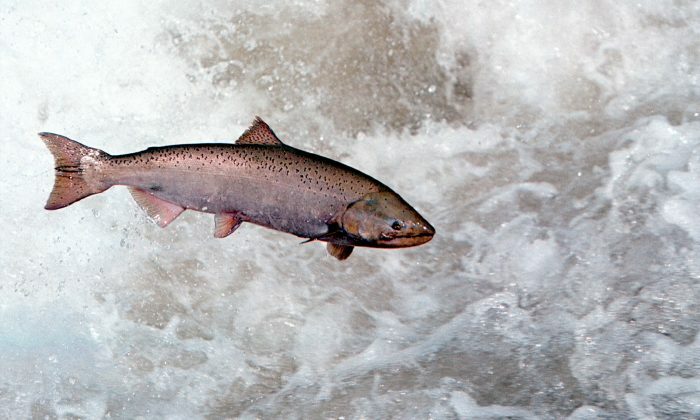 Changes in the natural environment, due to pollution and global warming, have also contributed to the decline in salmon runs over time, according to numerous extensive studies by biologists. The June ruling upholds a 2013 order that Washington state must replace hundreds of culverts with more salmon-friendly setups, such as bridges. The culverts—underground diversions for streams to flow under roads—are made of large pipes that can block migrating fish. In May, a federal judge in Oregon ruled that efforts by the federal government to restore salmon habitats in the Northwest have been insufficient. Under that ruling, four large dams on the lower Snake River in Eastern Washington could be removed. The Snake River is a major tributary to the Columbia River, the fourth largest in the country. The removal of dams to restore the health of salmon runs would not be unprecedented. In April, the federal government signed agreements with state governments in Oregon and California to remove four hydroelectric dams on the Klamath River. Those dams have been blocking salmon runs for 150 years. Dams can have a devastating impact on the hundreds of thousands of more than a dozen species of salmon that swim upstream every year to spawn and die. They block the fish from migrating to their spawning grounds and degrade the water quality, leading to the spread of fish disease and algae bloom. Salmon that manage to migrate and spawn also make a vital contribution to the health of forest ecosystems. Their nutrient-rich carcasses decay in the forest, feeding the soil and enriching biodiversity in the area. Many Native American tribes in the Northwest also consider salmon sacred and use them as a cornerstone of ancient cultural ceremonies. Treaty rights grant those tribes access to and sufficient supply in their traditional runs of salmon. As several species of salmon have landed on the endangered or threatened species lists over the years, tribes have been vocal about the problem. Their interests are described as extremely personal. “Our allocation of fish this year doesn’t meet half of our subsistence for our people,” said Yurok Tribe Vice Chairman David Gensaw. “This is a threat to our culture, our religion, and the economic survival of our people.” The Yurok is California’s largest Native American tribe, with about 5,000 members. According to the National Oceanic and Atmospheric Administration (NOAA), the federal agency that monitors the oceans and rivers of the United States, salmon face more than the threat of culverts or dams. Milstein added that water levels and temperature can also come into play. Salmon need cold water to thrive. Often streams get diverted to irrigate farms in agricultural regions, so the government is working with farmers to find solutions. That means installing pumps for farmers—instead of diverting cold mountain streams—and providing grant funding for installing sprinklers instead of using the more wasteful method of flood irrigation to water crops. Some conditions are beyond the government’s control, though. A particularly strong El Nino has also impacted the ocean water temperature, where adult salmon spend most of their lives. The warmer water temperatures mean fewer nutrients, which mean less robust salmon. The fish need a tremendous amount of strength to swim upstream to return to where they were born before they spawn and die. The Columbia River Inter-Tribal Fishing Commission is dedicated to the issue. The commission is composed of four major regional tribes: Yakama, Umatilla, Warm Springs, and Nez Perce. They are looking ahead to deal with a range of threats to salmon, some of which are massive. Thompson also said that the tribes in the commission want to start a regional discussion on the “health and management of our floodplains.” They will start with a mid-August technical workshop, followed by the Future of Our Salmon Conference in October.